In addition to its familiar functions such as improving ventilation and filtering out impurities, mesh can also affect sound and offers sterilization and decomposition functions when combined with other materials. Mesh technology truly has unlimited potential. Technologies currently under research and development are outlined here. 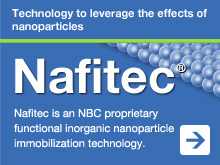 Mesh technology and nanotechnology are two pillars of NBC Meshtec's business activities. Building quality into products through the manufacturing process - our inspection system is capable of catching all defects. Research on mesh as a structure, focusing on the development of functionality using nanoparticles, with the aim of implementing functional meshes from basic seed technologies proposed by universities and research institutes. 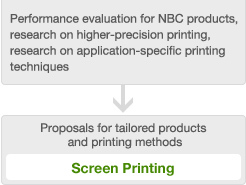 In addition to their detailed knowledge of our products, the company's sales staff also constantly study product evaluation, basic data on emulsions/pastes and printing techniques to help them make better proposals. All rights reserved. Copyright (c) NBC Meshtec Inc.